Idling a vehicle for just one minute produces more carbon monoxide than smoke from three packs of cigarettes. Elevated exposure to air pollution can permanently damage children's respiratory systems because they breathe 50% more air per pound of body weight, spend more time outdoors, and are more active than adults. Yet, adults wait in running vehicles for as long as 30 minutes to pick up their children at school every day. 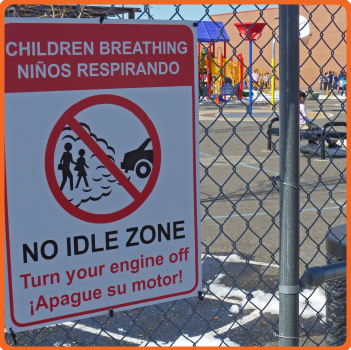 Clean Air at Schools: Engines Off! (CASEO) is a collaboration campaign between federal, state, and local governments, county school districts, regional air quality planners and non-profit organizations in Colorado. 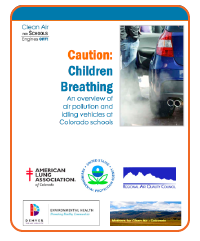 The aim of CASEO is to reduce air pollution exposure at schools in Colorado by working with parents and school administrators to raise awareness of the risks from vehicle emissions and to reduce idling vehicles at pick up time. In addition, CASEO works with school districts to upgrade and retrofit their diesel school buses with emissions control technologies. In 2012, CASEO received the Model Practice designation from the National Association of County & City Health Officials (NACCHO) as an initiative that demonstrates how local health departments and their community partners can effectively collaborate to address local public health concerns. The program has been added to their Model Practices Database, an online, searchable collection of innovative best practices across public health areas. CASEO, the first idle-reduction campaign to be included in NACCHO’s Model Practices Database, especially stood out to the peer review board for providing measureable results and using community-based social marketing tools to engage its target audience. Rather than simply provide information to drivers, CASEO uses a community-based social marketing (CBSM) approach to deliver driver education on health risks, public commitment (pledge), and reminders throughout the school year to motivate drivers to turn their engines off. This program model has been demonstrated to be effective in achieving behavior change for public health issues, but it is not commonly utilized for environmental health projects. CASEO has successfully collaborated with schools, students, and parents to improve air quality outside of schools at pick up time. 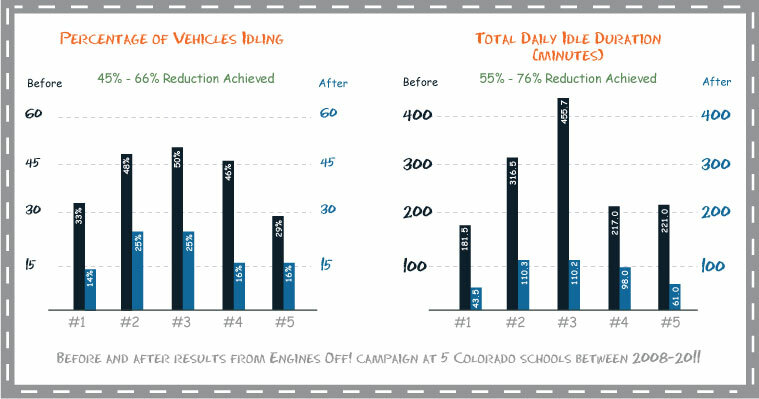 Before and after results from five CASEO schools in the first three years of the program show significant reductions in the percent and duration of idling. 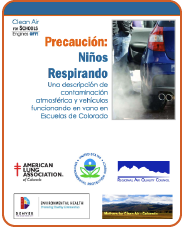 For more information on how we developed our community-based social marketing campaign to reduce air pollution and idling at Colorado schools, please read our report Caution: Children Breathing, which is available in English and Spanish. Download the complete CASEO infographic to read more about the program's main messages and results. The US EPA’s Idle Free Schools program has an online toolkit to run an effective idling reduction campaign at your school. Measure the problem at your school. These tips for collecting idling observations, vehicle type chart, and sample idling observation data sheet should help you to collect accurate data so that you can report the problem to your school community and track your impact. Make a commitment to your child not to idle at pick up time with this pledge form. 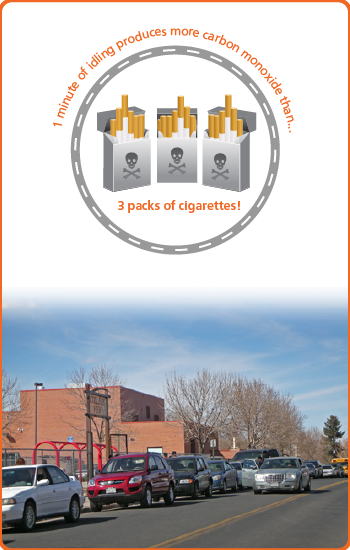 Contact the American Lung Association in Colorado to learn how to implement the complete CASEO idle reduction campaign at your school. Read our 1-page fact sheet with driving tips to save fuel and money. School buses also transport children and idle near schools. Visit the page on buses for more information on idle reduction tips and technologies for this type of vehicle. Ask your school district to adopt a School Bus Idling Policy, whether the school bus fleet is owned by the district and/or contracted to a private bus company. Idling wastes fuel and pollutes our air. When you stop, turn your Engine Off!